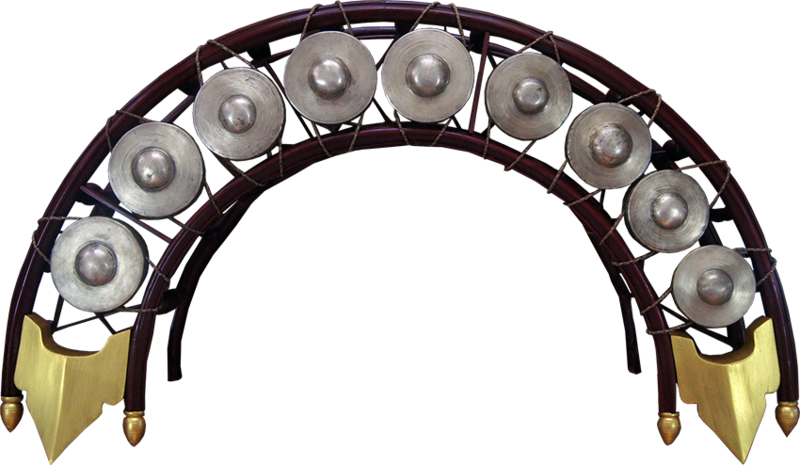 Gong chime - Site de soundsofangkor ! The gong chime appears for the first time in the 16th century on the bas-reliefs of the north gallery of Angkor Wat. A painting in the central sanctuary of this same temple, provisionally dated also from the 16th century, shows two gong chimes in an orchestra that prefigures contemporary pin peat. 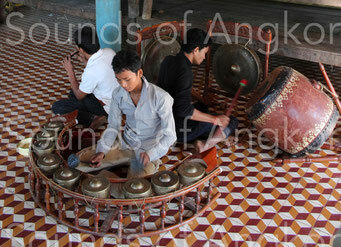 The gong chime in question is still played in Siem Reap. 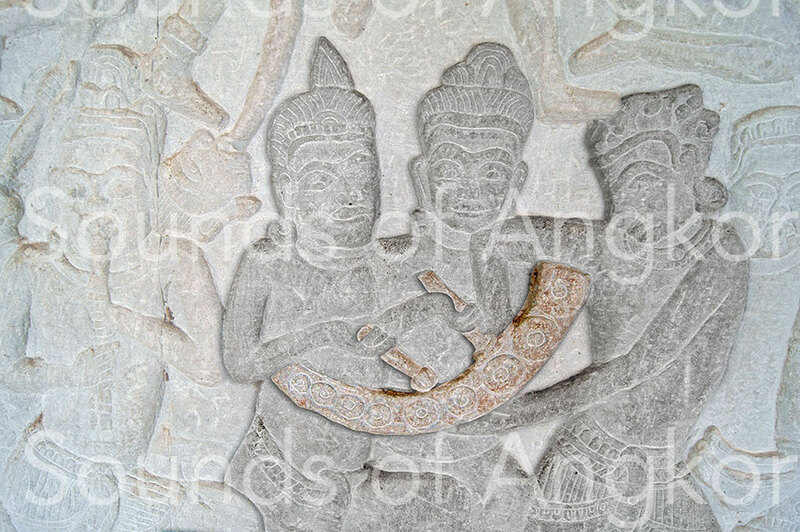 In the north gallery of Angkor Wat and on the two frescoes of its central tower appear the gong chimes arranged in arc of circle. They consist of a frame on which are arranged eight to nine bossed gongs struck with mallets. This group survived in the funeral rituals of the Khmer until the seventies. Currently, this instrument survives thanks to the association Cambodian Living Arts which created two classes in Siem Reap where the funeral kantoam ming repertoire of is taught, the only one to use the nine-gong chime. 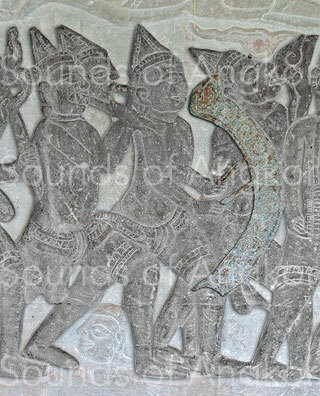 Sets also exist in the Surin province in Thailand surviving at the Khmer rouge revolution. On the bas-relief below are grouped, from right to left, a chime with nine gongs, two oboes, two bossed gongs and a large drum. This kantoam ming ensemble (also called kong skor or trai leak) consists of a nine-gong chime, an oboe, two hanging bossed gongs and a drum. The resemblance is striking ! Set of instruments prefiguring the kong skor funerary orchestra: large drum, pair of bossed gongs, pair of oboes, nine-gong chime. Angkor Wat, north gallery. 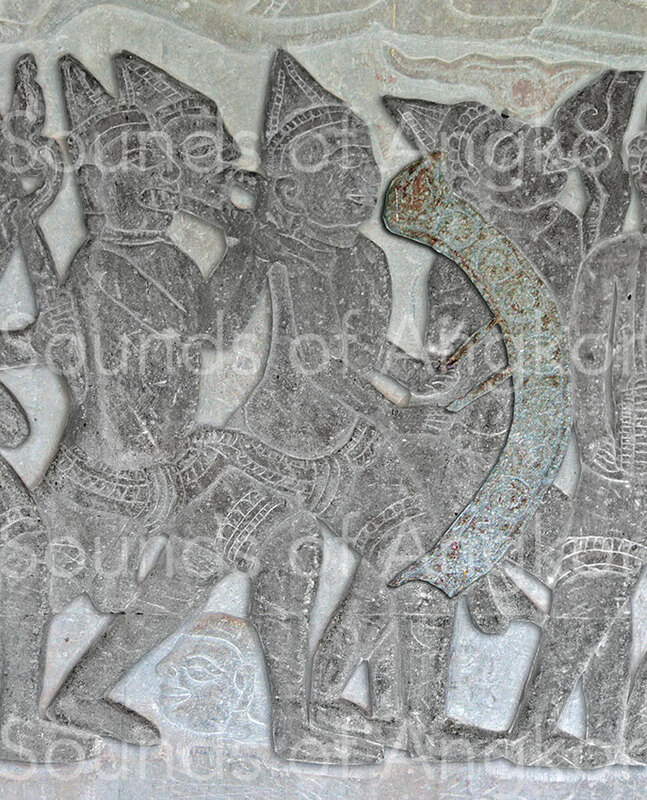 Krishna's victory over the Asura Bāna. 16th century. Nine-gong chime. 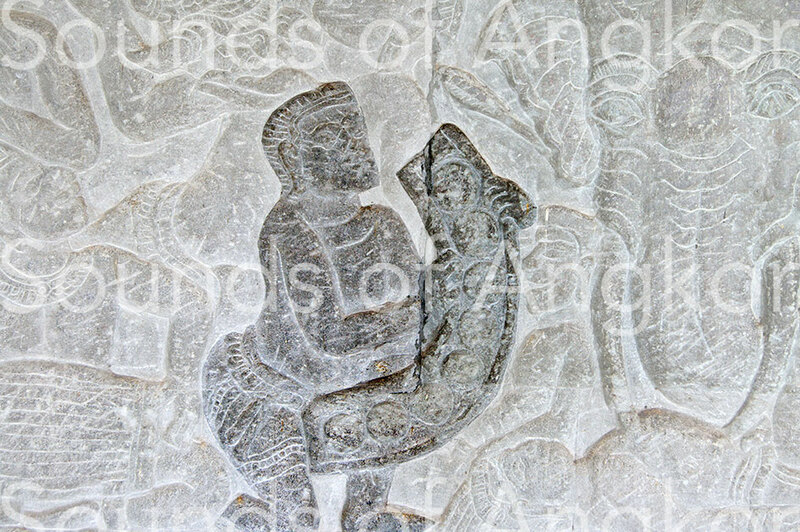 Angkor Wat, north gallery. 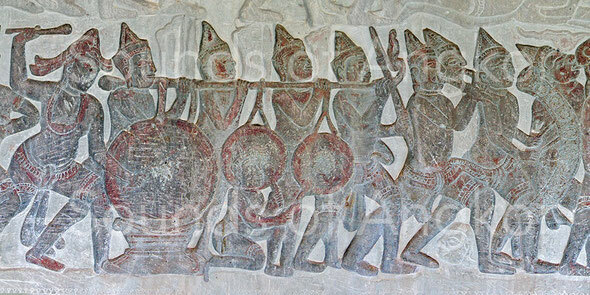 Krishna's victory over the Asura Bāna. 16th c.
Eight-gong chime. 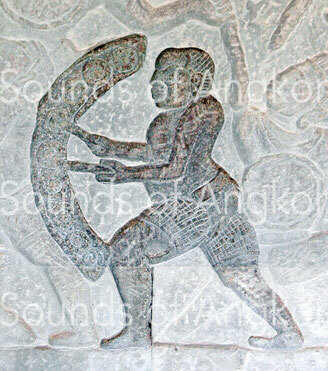 Angkor Wat, north gallery. Krishna's victory over the Asura Bāna. 16th c.